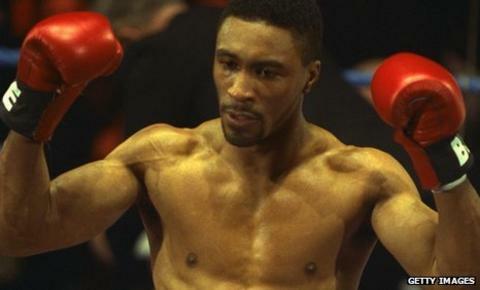 Former super-middleweight boxer Michael Watson wants to take another inspirational step in his recovery by lighting the Olympic flame at next year's London Games. Two decades have passed since the night a 26-year-old Watson was paralysed after his infamous second fight against Chris Eubank at White Hart Lane on 21 September 1991. This year, 20 years to the day later, boxing promoter Barry Hearn organised a charity dinner event at London's Dorchester Hotel as a tribute to Watson's remarkable and continued recovery. Watson says his dream is to inspire others by lighting the Olympic flame. "Everywhere I go I want to inspire people and young teenagers," says Watson, now 46 and still partially paralysed. "I want to play a role in the 2012 Olympics. "A lot of people still think that I'm in a wheelchair. They think I'm bed-ridden, they don't even believe it's me. I looked death in the face. People said Michael Watson would not survive, they said I would become a cabbage, but I can think for myself, I can walk and talk. "If the public see Michael Watson light the Olympic torch, they'll be astounded, because I should really be nothing, I should be bed-bound. "I think that my involvement in the Olympics will inspire everyone as they will see that, if you are positive, you will succeed against all the odds. I want them to look at me and see how I overcame difficulties and remained positive." Watson required six operations and spent 40 days in a coma and it was six years before he began to walk again. Incredibly, he completed the London Marathon in 2003, walking two hours each morning and afternoon for six days, and the following year he was awarded the MBE. "But no, I didn't look back, I kept looking to the future. And that's what I've been doing - looking ahead and not back." Watson has some unfinished business with the Olympic Games. In 1984, as a 19-year-old, he blew his chance to secure a place in Great Britain's team for the Los Angeles Games. "In 1984 I won in the ABAs," he recalls. "I beat John Beckles, the glamour boy, English hope; I was the underdog and shouldn't have lasted many rounds. I went in and knocked him out in the first round. "After that I met Russell Barker from Enfield in the semi-final of the qualifiers for a place in the Los Angeles Olympic Games. I went into the fight over-confident, I stuck my chin out and it was CRACK! "That taught me not to underestimate anybody in life. After that I knew the amateur ranks weren't for me. I thought there was no point in me wasting time, so I turned pro and felt so comfortable." Watson would never win a world title, with his narrow points defeat in the first fight against Eubank a matter of some debate, but he received the WBO people's champion belt at his dinner event in London. "I was extremely overwhelmed," he says. "Justice has been done and I received my belt. The WBO recognised me as a 'super legend', and the official secretary of the WBO said to me, 'Mike, this belt should have been yours from day one.' Good things come to those who wait." Watson's best friend and now carer, Lennard Ballack, says, "It's great Mike received the belt; he was denied the belt when in fact he had won it. To have had the belt unfairly snatched from him, with millions watching on TV, we are now delighted that justice has been served." As for boxing today, Watson believes the sport is poorer than during his prime in the 1980s and 1990s. "Nowadays, I don't watch that much boxing," he admits. "They're all too pampered, the hunger isn't there any more. You can't beat the old classics. However, I do go to some events but only when I've been invited. "I still go to the boxing gym - that's my home, working on the punching pads - and do some training. I love to keep active and training will always be part of my life." And on his future plans, Watson is bullish: "My best is yet to come! I'm a patron for Teenage Cancer Trust and I try to visit the teenagers in the special units TCT build in hospitals, when I can. "They say boxing is hard but, when you're fighting for your life, you have to draw on every single bit of fighting spirit to survive. They relate to my struggle and how near I was to death's door, and it's so rewarding to sit and talk to them and offer them hope and encouragement. "When I explain what happened to me you can see the light coming back into their eyes. It's a very humbling experience." And Watson, who grew up in Stoke Newington in north London, is also keen to help tackle the rise in gang culture in the UK. "Helping to fight the gun and knife crime explosion that's happening here in the UK is a project I would like to get involved with," he says. "With the Olympics coming up, my message is don't hold a gun hold a torch."